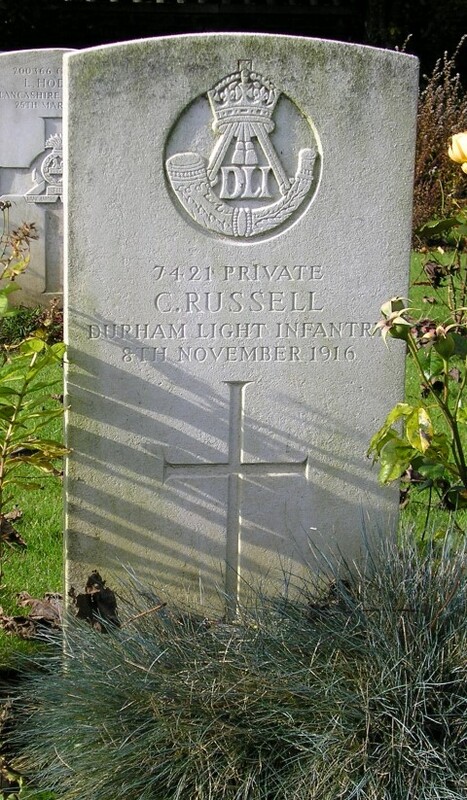 7421 Private Charles Russell, 1/9th Battalion, the Durham Light Infantry died of wounds 8 November 1916 and is buried at Douchy-les-Ayette British Cemetery. He was 18 years old and is commemorated on the Cockfield War Memorial. Charles Russell enlisted at Bishop Auckland into the 1/9th DLI and was given the regimental number 7421. Usually men from south west Durham joined their local territorial force, the 6th DLI but in this instance Charles joined the 1/9th. The service details of Private C. Russell have not been researched. The Second Battle of Ypres: 24 April – 25 May 1915. The Battle of Flers-Courcelette, 6th phase of the Battle of the Somme, 15-22 September 1916. The Battle of Morval, 7th phase of the Battle of the Somme, 25-28 September 1916. Private C. Russell entered France 18 November 1915. He would have been 17 years old. Adverse weather conditions i.e. the autumn rains and early winter sleet and snow, turned the battlefield into morass of mud. Such intolerable physical conditions helped to bring to an end Allied offensive operations after four and a half months of slaughter. The fighting brought no significant breakthrough. Territorial gain was a strip of land approximately 20 miles wide by 6 miles deep, won at enormous cost. British and Commonwealth forces were calculated to have 419,654 casualties (dead, wounded and missing) of which some 131,000 were dead. French casualties amounted to 204,253. German casualties were estimated between 450,000 to 600,000. In the spring of 1917, the German forces fell back to their newly prepared defences, the Hindenburg Line and there were no further significant engagements in the Somme sector until the Germans mounted their major offensive in March 1918. The 1/9th Battalion of the Durham Light Infantry saw action at Butte de Warlencourt, an ancient burial mound, located between the towns of Albert and Bapaume in northern France. Bapaume was occupied by German troops. The British front line had advanced from a few miles north east of Albert in the direction of Bapaume to the feature known as the Butte de Warlencourt which lay a few miles to the south west of Bapaume. The Butte stood about 50 feet higher than the surrounding land and in theory provided a useful observation point for the Germans particularly towards High Wood and Martinpuich. The Butte was honeycombed with tunnels and dugouts which provided shelter for the German garrison. It had already resisted numerous British attacks over the previous month of October. The 3 Durham Battalions took over the front line positions and the 1/5th Borders came up behind them as the reserve battalion. The 1/6th Durhams was a battalion recruited mainly in Bishop Auckland and the upper valley of the river Wear and were in the centre of the line. The 1/8th was to the right and the 1/9th, known as the “Gateshead Ghurkas” was to the left. Together they would attack the Butte, 5 November 1916. The1/9th DLI was charged with capturing the Butte and a quarry beside its west face. The 1/6 and 1/8th DLI were to seize the Gird Trench and Gird Support Trenches. The 28th Australian Division was to attack alongside the 8th battalion. In support, to the right were the 1/4th Northumberland Fusiliers, to the left, the 1/6th N.Fs. and the 1/5th Border Regiment were in reserve. 5 November: Zero hour was set for 0910, the 50th Division attacked with 1/8 DLI (151 Brigade) on the right. The men had to pull one another out of the mud before they could start. They almost reached the German front line but were stopped by machine gun fire and gradually fell back during the day. The 1/6 DLI suffered a similar fate except on the left where they linked with 1/9 DLI in the line. The 1/9 DLI went through 2 lines of German trenches, reached the Butte and established a post on the Bapaume road – some entering the Warlencourt line. But these advanced posts were forced back and at 10.00pm the enemy was still holding the quarry and 500 yards of the German front line. By midnight the Durhams had been forced back to their own lines. “On the left the 9th DLI met with less opposition and succeeded in gaining all its objectives without suffering heavy casualties. The German barrage came down at about four minutes after [the start of the attack]. The initial task met with success but then after 3.00pm a heavily reinforced counter attack and gradually, the battalion forced back. At 5.00pm Lieutenant Colonel Bradford reported that he had been driven out of Gird Front Line, posts had been captured, the enemy was in considerable force, still counter attacking, difficult to hold Butte Alley and asked the artillery to shell specific positions north of Bapaume Road. The machine gun post mentioned above was clearly causing major problems. Hand to hand fighting was taking place. Then 4 hours of bombardment followed and a final, successful counter attack. Many of the missing later were found to be dead. Private C. Russell was awarded the 1914-15 Star, the British War and Victory medals. 1672 Private Alfred Brown, 1/6 DLI born in Evenwood. He is buried in Warlencourt British Cemetery, grave ref. VIII. B.7. 3429 Private Fred Brunskill, 1/6 DLI of High Etherley. He is buried at Warlencourt British Cemetery, grave ref, VIII.B.11. 2211 Corporal Ralph Hebdon, 1/6 DLI of Tindale Crescent. He is buried in Warlencourt British Cemetery, grave ref. VIII.B.6. 3124 Private Robert Wilson, 1/6 DLI of West Auckland. No known grave and commemorated on the Thiepval Memorial. 3472 Corporal George Cox, 1/6 DLI of Evenwood. No known grave and commemorated on the Thiepval Memorial. No doubt in such close communities these men would have been known to each other. 151 MGC had 2 Vickers guns with each front battalion, 6 guns in support and 4 in reserve (16 guns). 2 guns were attached to 9/DLI and when the Butte was captured, Corporal T.H. Rutherford of “B” Section, established his gun on the Bapaume Road but very soon afterwards became casualties. Corporal W. Mewes’ gun team attached to the same battalion suffered the same fate. Corporal M. Watson then went forward to replace those knocked out. Both flanks were open and Serjeant J. Glennell and Corporal M. Butler also went forward with their guns to help cover the exposed positions and the 3 guns played a vital role in repulsing the first German counter-attack which took place at about 11.00pm, 5 November. The Germans counter-attacked again in strength and with the 151 Brigade decimated, it was forced to withdraw. It was relieved by the 150 Brigade at night, 6 November. A whole German Guards Division was rushed up from Bapaume to take part in the counter-attack at midnight, 5 November and these elite troops were well supported by guns of army corps strength. A plan for a British attack 7 November was abandoned due to very heavy rain and the Butte remained in German hands. “The position was most precarious which made Captain Palmer, in charge of infantry on the spot, decide to climb the Butte and discover what was happening on the German side of the hill. What he saw convinced him that the Germans were about to launch a counter-attack on a big scale. Arriving back in our lines Captain Palmer immediately ordered his men to return to the original trenches and Corporal Watson was instructed to get his gun back right away to the old gun position. Watson reached up to take the gun from the trench, turned round and found his solitary gunner Pte. McRoberts holding a revolver in the ribs of a Prussian Guardsman, who had somehow found his way to the rear of the machine-gun post. A timber cross, to commemorate those who had fallen, was made and erected by Pioneers of the 9/DLI using what scrap wood, ration and munitions boxes they could find. Another 2 smaller crosses were erected to commemorate the 6th and 8th Battalions and they stood together on the Butte de Warlencourt battlefield until they were removed in 1926. In February 1927, the large cross was then placed in the DLI Chapel, Durham Cathedral and the other crosses were placed in St. Andrew’s Church, South Church, Bishop Auckland and the St. Mary’s and St. Cuthbert’s Church, Chester-le-Street. The Western Front Association erected a Memorial to those who fell in the capture of the Butte de Warlencourt. The Butte is now clad with trees and the Memorial is positioned to the east on the high ground in a small clearing overlooking the battleground. Due to the dangerous nature of the site, access is by way of a clearly marked footpath. The gate is usually locked and only limited access is available. The CWGC Warlencourt Cemetery is located about a kilometre to the north, visible from this memorial and here lies other souls who lost their lives in actions about that time.